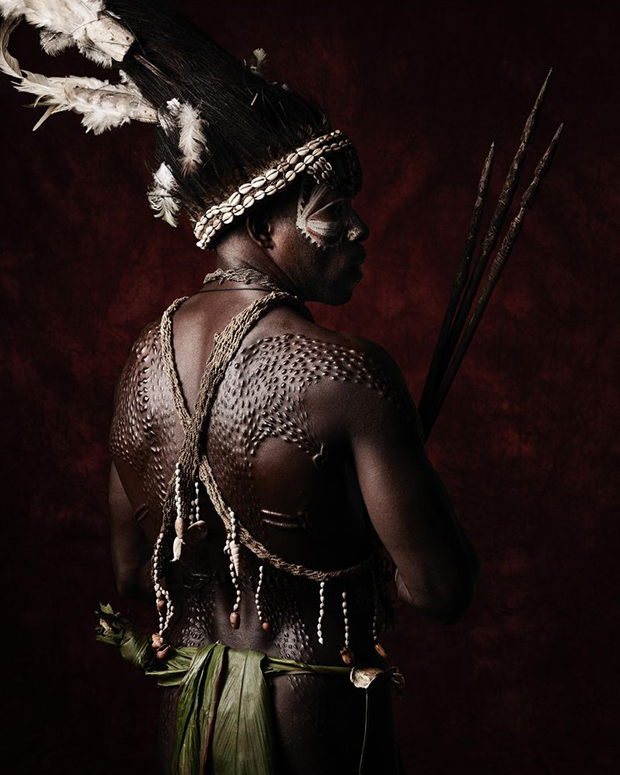 Joseph Kayan, a Goroka Show participant from Chimbu Province, wears boar tusks and the tail of a tree kangaroo around his neck. The design of his headdress is specific to his village: it includes bird-of-paradise feathers, with reeds to fill out the shape. His armlets hold sprigs of plants from his region. Is any place on the planet less familiar to Americans than heavily forested, mountainous, linguistically complex, faraway Papua New Guinea? 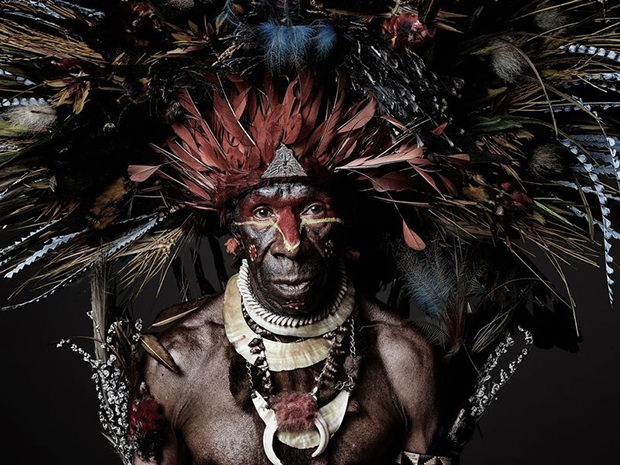 The photographer Sandro, who’s based in Chicago, went to the Eastern Highlands and attended the Goroka Show. That’s a three-day festival where people from all over the country showcase their customs. 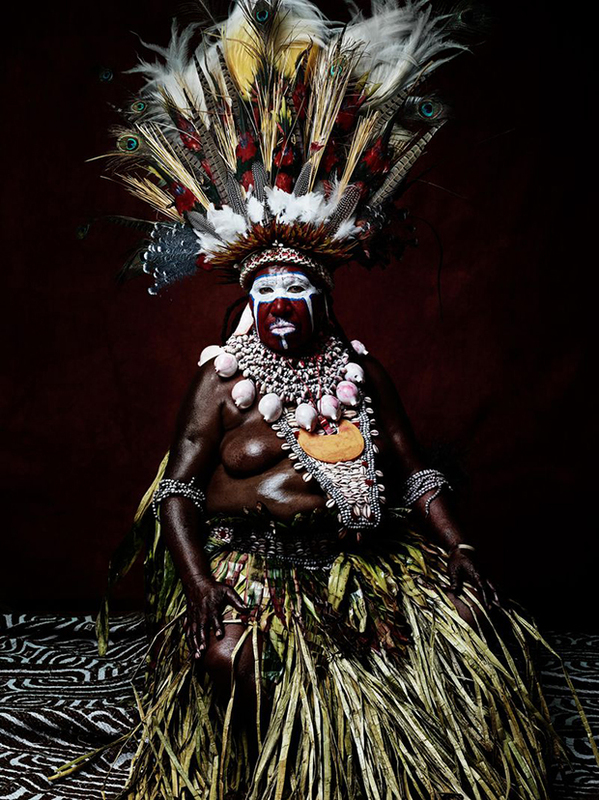 In a makeshift studio Sandro photographed men and women wearing costumes unique to their villages. Read the rest of Torsten Blackwood’s article on Sandro’s photographs at Smithsonian Magazine. 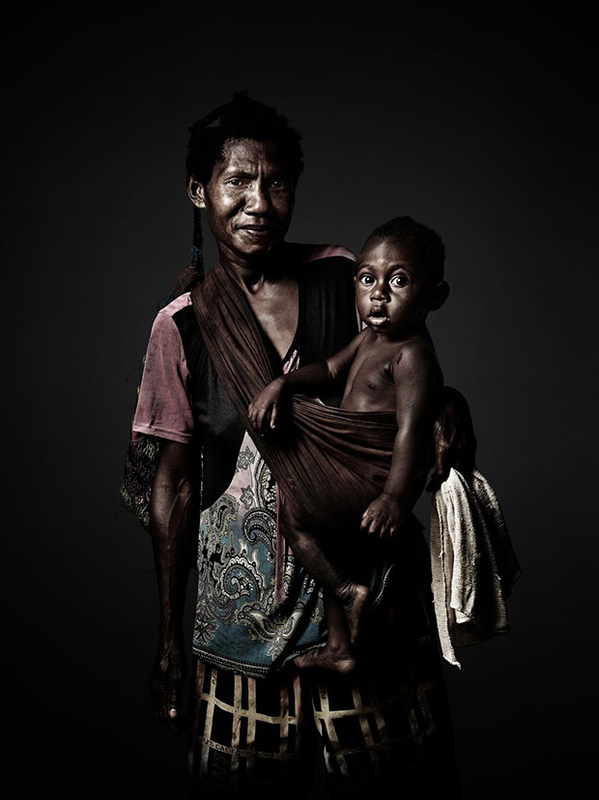 Nellie Gowey, 32, carries her son to the annual Crocodile Festival on the Sepik River. Clothing like hers is bought in town and often supplied by missionaries, who frown upon grass skirts. Grass, however, can be easily replaced, while cloth must be washed in muddy rivers that are inhabited by crocodiles. Regina Richard, 45, wears an heirloom headdress with feathers taken from peacocks and birds-of-paradise. The kina shells on her necklace are a status symbol. Shells were legal currency in Papua New Guinea until 1933, and they’re still used to purchase brides and settle blood feuds. The local currency is still called the kina. David Gowep, 64, holds the head of a costume used to dramatize an ancient legend. 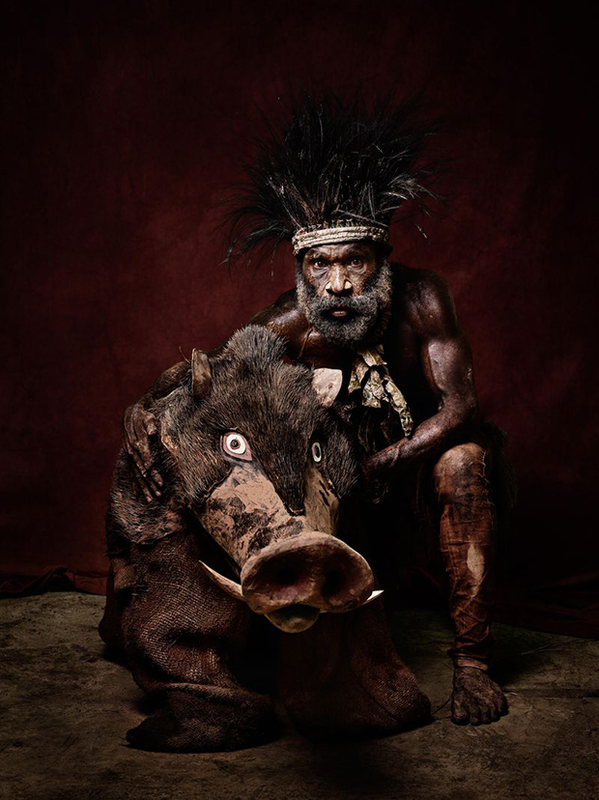 His group, the Wanie people, believe a wild boar called Jambuis led their ancestors into the daylight after they had lived underground for some 300 years. David’s legs are clad in mud-soaked cloth to represent these subterranean origins.